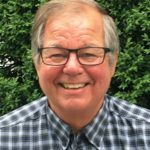 Mark Battin is recently retired from a real estate career in the Staunton, Waynesboro and Augusta region, and also brings to VCC a wealth of experience in sustainable farming and ranching. After graduating from Dartmouth College, Mark joined the Peace Corps, it was here that his views on the importance of education were formed in the jungles of Venezuela. They were further defined on the multi-use ranches he developed in the mountains of California. So remote the only way to maintain a foothold was through true diversification, these ranches were forward thinking in sustainable timber, agriculture and water use management. Since retiring, Mark is focused on spending time on local waterways, kayaking and fly fishing, reinvigorating his lifelong commitment to sound water and land use.